Subtle, ordinary, beautiful, and absolutely, heart wrenching. 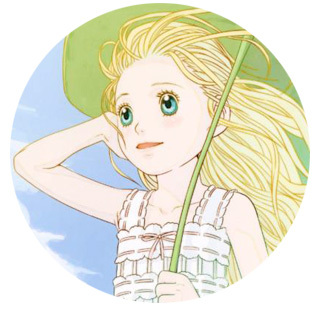 I have no other words to describe Chika Umino's Honey and Clover. It is the American Beauty of college life. It is the simple dance of a plastic bag in the wind; sad that it has no control of its own fate but elated because it has been given a whole new life other than holding groceries to and from a car's trunk. It is one of the shortest words ever uttered, "Hi", that will tilt the axis on which the world turns. The bat of an eye, stronger than the word of any king or queen, can kill a man. The happiness of someone just sitting next to you for 10 seconds will overcome the years of suffering that they put you through. And then you are wondering during the next few years of suffering, if those 10 seconds were worth it. College life was simple for Yuta Takemoto. It was his escape from his home; wake up, go to school, create art, and go to sleep was his regular schedule. He hung out with the guys in his apartment complex once in a while and if they are lucky, like most poor college students, they get a good meal in. 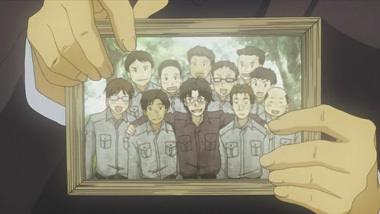 He goes to school with two of them, Takumi Mayama and Shinobu Morita. These former roommates couldn't be further apart in their personalities: clean, logical, totally in control vs. crazy, lucky-if-he showers-every-week, spontaneous and poor Yuta is constantly stuck in the middle, mediating and keeping everyone alive. Life was not complicated. He did not leave any broken hearts lying around in school pining for him. Ayumi "Iron Man" Yamada still loses control every time she hears Takumi's name being mentioned. Poise and concentration needed for her beautiful pottery cracks, crumbles, and turns into sad wet lumps and violent splatters of clay. She knows there is no future for them; Takumi is in love with his boss, Rika Harada, from his part time job. 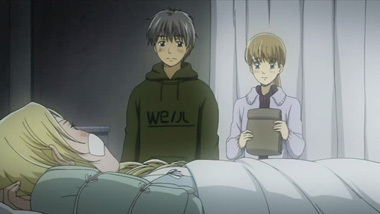 Just as Rika won't accept Takumi, because she doesn't want to forget her dead husband and forgive herself for killing him, Takumi won't accept Ayumi. She can't let go though; no matter how she hurts, she has to persevere and stay his friend, just to spend hours dressing up and preparing herself to see him in hopes of hearing the smallest insignificant compliments, "You look good." Life was not mysterious like Shinobu was. He would suddenly disappear for days on end and re-appear just as suddenly with wads of cash in his pockets and bearing the strangest gifts. One time was 20 pounds of croquettes and another was bags of expensive cuts of beef. He would always return very much worse for the wear and pass out for 48 hours straight. With so much cash, he still steals materials for his art projects from other students in the school and hoards food from wherever and whoever he can. As dense as he is some times, he is also extremely perceptive of the people around him. How else can he know exactly which buttons to press to irritate Takumi into choking the living daylight out of him? And then, it is the bat of an eye that tilted the axis on which Yuta's world turned. 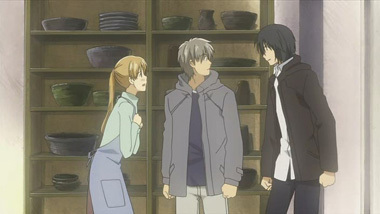 Shuji Hanamoto, an art professor at Yuta's art college, brings his cousin's daughter to study there. Even though she is 18 years old, Hagumi "Hagu" Hanamoto is small for her age and has led a very sheltered life. Both Yuta and Shinobu fell in love with her the minute they laid eyes on her. Yuta, in speechless awe of her talent and presence, chose the path of confidant, supporter, and brother to quietly express his love for her. 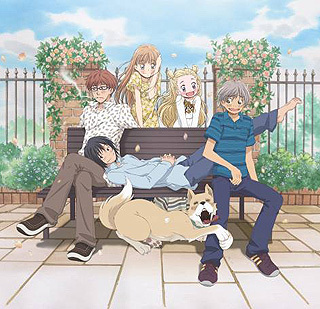 Shinobu, in exuberant love of her cuteness and talent to create works that rival his in size, chose the path of giddy, subtle but direct, and spontaneous admirer. Can Yuta's world right itself again? Will the happiness of having Hagu sit across from him eating pudding one time overcome the pain of seeing her go on dates with Shinobu or seeing her hurt by him? Ayumi wonders while she's suffering as Takumi's friend, if those three words, "You look good", were worth it. The happy worry-free times they all had hanging out as friends in college; is that the price they have to pay for love, for growing up, for finding out who they want to be when they go out into the real world? Which one did you choose: friendship, love, or nothing at all? 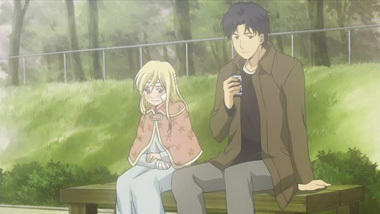 Below: Scenes from Honey and Clover. 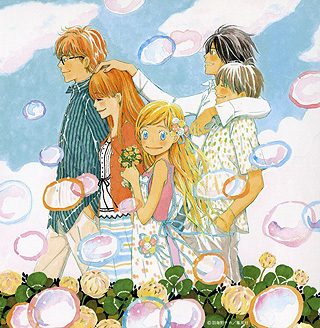 Below:The Japanese opening titles for Honey and Clover. 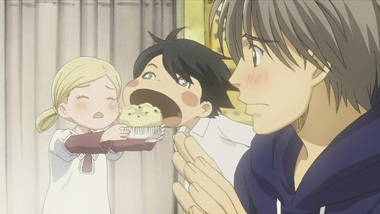 Below: An Englished dubbed trailer for Honey and Clover. 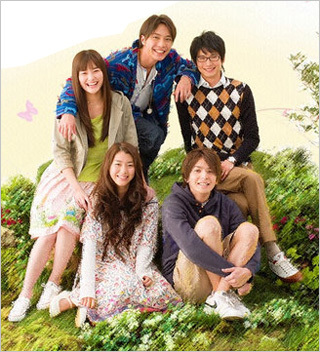 Below: Promotional shot from the live action Honey and Clover series. 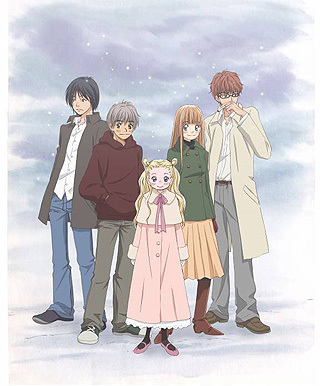 Below: Promotional and manga illustrations from Honey and Clover.